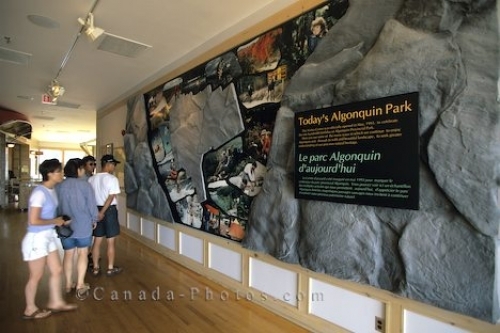 The visitor centre in Algonquin Provincial Park in Ontario, Canada provides tourists with an abundance of information. The visitors centre in Algonquin Provincial Park in Ontario, Canada is the easiest and most knowledgeable way to find out everything about this Provincial Park. This visitor centre was opened in 1993 and has some of the most exquisite exhibits as well as a restaurant, bookstore and a small theatre. The Visitor Centre at Algonquin Provincial Park in Ontario, Canada. Picture of a few of the displays at the visitors centre in Algonquin Provincial Park in Ontario, Canada.